Congratulations to Jess Peters who won this giveaway! One last giveaway, and it is a good one! 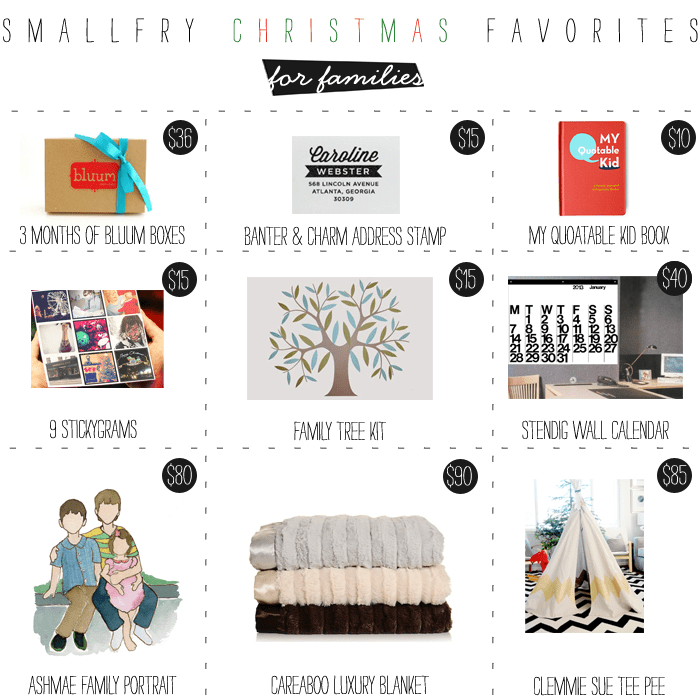 We’ve picked our favorite gifts that benefit the whole family and each one would make an incredible gift on its own, but altogether you’re looking at over $400 of Christmas cheer. 1. One of our partners, Bluum is generously giving away 3 months of their popular Bluum box! Each month you can sign up to receive samples of the latest gear, books, technology, gadgets, food, and toys for parents and kids. We’ve gotten a few Bluum boxes so far and they are awesome! Edible crayons? A book on positive parenting. You know it’s good if it comes in a Bluum box! 2. Our favorite return address stamp, customized however you like! We use these of course for all our mail, but you can even stamp your books, movies, or any other lendable belongings. By Banter and Charm. 3. My Quotable Kid book: kids really do say the darndest things. We’ll be laughing to tears during the day, and then our husbands come home and all the sudden we can’t remember exactly what the boys said that was so funny. It’s good to keep a record, and this book is perfect for just that! 4. Nine Stickygrams! Printing photos is sort of a lost art, but Stickygrams makes it really easy, just go in pick a few of your favorite Instagrams and they’ll send them right out. 5. How far up your family tree can you name? We can’t go very far unfortunately, but Family Tree Kits to the rescue! They have perfected the family tree with this minimal and stunning kit. Remember the generations that have come before you and have a beautiful piece of art displayed in your home at the same time! 6. The Stendig Wall Calendar is our favorite functional nod to the sixties. Each giant page is beautifully minimal, and goes with just about any decor. 7. Ashmae Family Portraits are our favorite way to capture our families at all our growing stages. A hand-drawn and watercolored custom portrait is the perfect gift and Ashmae is retiring these portraits at any minute, so you may very well be getting the last one! 8. Careaboo Luxury Blankets need little introduction. It’s like being wrapped in cool and soft mink, perfect for a family cuddle session. 9. Finally, battle the cold winter months with an indoor/outdoor play tee pee! You’ve seen these popping up everywhere, but Clemmie Sue‘s is the best value you’ll find! Okay, here’s how to enter! 1. Leave a comment letting us know your favorite family gift you’ve given or received. 2. 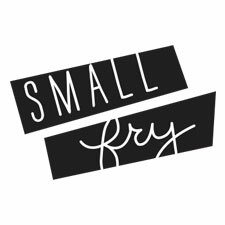 For extra entries follow Small Fry on any of the following sites & leave comments for each of the following entry opportunities: Small Fry Facebook Instagram (@smallfryblog) Small Fry Pinterest. 3. Instagram your favorite item on any of these gift guides (or Small Fry’s button below if you can’t choose just one) using and tag us #smallfryfavoritethings. This giveaway will close Tuesday the 18th in an effort to get the winner’s loot to them by Christmas. The winner will be randomly selected and notified and has 24 hours to claim their prize or another winner will be selected. My favorite family gift was a trip to NC. We all chipped in to buy my Grandfather in law a picnic table one year, and committed to once a month family cookouts that summer. He loved it! Best gift… Two simple gold bands to replace the wedding ring I lost. They say ME. Special because my husband and I share the same initials. Favorite gift…my husband set me up with a camera card that wirelessly uploads my pictures to my computer! I love it! Love Ashmae’s portraits–always wanted one! My fav gift I gave was to my parents with a box of watercolored slips of paper with memories I had of my childhood. My favorite gift that I’ve given so far was a play kitchen for my son who loves to cook with his daddy. We gave it to him last year from Santa and he has talked about it all year long (and played with it)! There’s nothing quite like a happy kid! my mom gave my husband and i christmas books to start our very own collection the 1st year we were married. books are always so special to me. i follow y’all on instagram. i liked y’all on facebook. i follow y’all on pinterest. I am a big fan of giving date nights as presents; restaurant gift certificates and movie passes etc. I love getting and receiving special ornaments. The ones from our engagement, wedding, and daughter are precious to us. My favorite gift was a simple necklace given by my hubby on our first Christmas together. My favorite family gift we received was a Phoenix Zoo year membership from my mom and dad! I love giving handmade gifts to each of my nieces and nephews every year. I think super hero capes were a favorite. what an amazing giveaway! my favorite gifts to give are always handmade. leading up to Christmas i spend the time and get so excited to see the reactions and hope they love it as much as i loved putting it together for them! Fav family gift we’ve given is handmade for the grandparents, from the kids. We have done canvas paintings and ornaments. Such special memories. MY favorite family gift I have received was a handmade by my sister in law. She is so crafty and it is something we will cherish forever. Following on Facebook – Fordology Blogs Page. My favorite gift I ever got was when I was eight. Santa brought a basket for my bike, and I remember crying because I was so excited. Oh the simple joy of being a kid. i like small fry on facebook. A blanket and a game… Simple, but a great way to bring us together. I love giving and getting games that the whole family can play. a few years ago i made my mom silhouette pictures of each of her kids and framed them. they were fun to make and it made her beyond happy! Every year I buy my dad a cd of “trendy” music, starting in middle school with Nirvana and going through to last year with Florence and the Machines. Still on the fence about what to get him this year, but he says he loves feeling cool while he’s cruising to work! My favorite gift that I gave to my sisters one year were these really cool outdoor drink holders. They are always having outdoor shindigs and these were a nice addition. Love when I can score something great in my budget! And I follow SF on Instagram! And I follow you now on FB! Uh, WOW! These gifts are amazing! I think my favorite gift I’ve ever received was a giant jar of buttons from my Grandma – I treasure those buttons and am so happy every time I get to use them in a project. My husband and I have been married for one year, and we’ve collected an ornament to commemorate every year we’ve been together. Last year, my brand new sister in law got us a “first year married” ornament. Favorite is the Ashmea Family Portrait. Following on Pinterest. Following on Instagram! I’m following Small Fry’s boards on Pinterest! We scanned and digitally enhanced all of my mom’s wedding photos and put them in a nice book for her a few years ago. She loved it and it was so much fun doing it. I’ve always loved giving and receiving “date nights”. The best gift I’ve ever received was probably camera equipment from my hubby. I always love thoughtful, homemade things too! Your button is on my blog (1). Your button is on my blog (2). Your button is on my blog (3). Your button is on my blog (4). Your button is on my blog (5). I love this! 🙂 Favorite family gift: a watercolor portrait of us all! P.S. following you on Pinterest and Facebook! My favorite present is getting a plane ticket so we’re able to spend the holiday with the rest of our families. My favorite family gift sounds silly, but it was a TV consol/buffet from my parents last year in anticipation of our need to baby proof, and bring better organization to our tiny apartment. The thought and time that my family put in to finding the furniture piece that would fit both my husband and my design aesthetic as well as functionality with a new walker/grabber/destructor on the loose, overwhelmed me with appreciation. I follow @smallfryblog on instagram now too! It’s not as much a gift as it is a tradition… but my husband is an airline pilot and in the early years of our marriage (read: pre kids) we traveled often and collected Christmas ornaments from wherever we visited. We really enjoy our memory ornament tree at Christmas time! My favorite gifts my parents give my husband and I is a plane ticket home for the holidays! My Favoritegift tradition my husband and I started with our kids is for their first Christmas we get them a musical instrument. For our son Max we got him a Ukulele and for our son Jack we got him a djembe drum. It is something that they will grow up with and be special and will last. I follow “Small Fry Blog” on Facebook. I follow “Small Fry Blog” on Pinterest. I love getting experiences as gifts! Best gift…the wedding my parents hosted for me and my husband the week after Christmas. Love Ashmae!! What a fabulous giveaway. I love handmade gifts as well. This year, I’m making my newly-married sister a “Holiday Starter Kit” with some handmade decorations. And I follow small fry on facebook! My favorite family gift last year was an ice cream maker! I follow @smallfryblog on Instagram. We got his & her perfume w/ a date night and a blanket for our baby when he was born. Best gift ever. my favorite gift that I have given to my family would be calendar I actually created this year. our family dog passed away a few months back, so the calendar is filled with tons of pictures of her and us and all the good moments we had with her. My favorite gift I have given was a book of all my husbands love letter that I have written to him and ones he has written to me. So tender and easy to make, but it has so much meaning. I follow small fry’s pinterest. My favorite holiday present is being able to see my family and my husband’s! I like smallfry on facebook. Every year, we give ornaments to the people we love – and we get them, too! I love having something unique and special up on the tree to commemorate our years together. my favorite family gifts are games we can play together! The best gift I’ve given was retouched old photos of my great grandparents and grandparents to my parents. They cried and it was such a happy memory! The best gift that I’ve given and received is LOVE. Nothing can buy pure love, and its an action we should share every single day, not just on Christmas. Especially after today’s tragedy is important to tell our love ones how much we truly love them! and put a small fry button on my blog! This year my husband is making my sister a farm table for her dining/home school room. I am so excited for their family to have this table! Everytime I see her I want to explode! I follow Small Fry on Instragram! So far my favorite family gift to have received is the new dining chairs that my parents bought me and my husband for Christmas. My favorite family gift that I have giving is a casserole dish etched with the family’s last name. I surprised my husband with an ipod on a year we said we weren’t going to get anything for each other. He was mad because he hadn’t gotten anything for me, but he loved it too. I would love to surprise him with all of this! OOOOO I want to win all of these! My favorite gift I have received is beautiful glass jewelry box from my husband. For sure an heir loom piece! A favorite gift I have given is a book to my children’s grandparents full of pictures of them with out children over the years! It was a special time to watch them look at it on Christmas Day! Already follow. But my greatest gift from my partner was a CD of him singing. He has an amazing voice but is too shy to sing in public. So for him to record his songs as a gift is an amazing thing. MY favorite gift received was a custom-built bookshelf for our entry. It’s gorgeous, and really filled a need. Cheesy, I know…but my son is the best gift I’ve given and received! My favorite family gift as a child was the Ungame. It was a game of questions to ask each other and I loved hearing my parents answer questions. My favorite gift that my family received was a family vacation a few years ago. It was a wonderful chance to get away for awhile and catchup with my parents and brother. Plus-I was able to get some great photos for scrapbooking, too! 🙂 (i proudly follow Small Fry on instagram!) thanks! My favourite family gift was a pair of red Olympic mittens and a matching hat. My MIL had gotten mitts and hats for the whole family (grandchildren included!) and we took a big family photo wearing our gear. It’s one of my fave photos to-date! I am following Small Fry on Pinterest! When I was younger all my mom’s siblings would swap family names and I remember one year we got a new board game…maybe cranium…and it was so fun to have a new games to play as a family! One of my favorite family gifts was when my mom (a dental hygienist) gave us all electric tooth brushes. Kinda silly, but totally practical! My twin daughters. BEST. GIFT. EVER. Such a great giveaway! I follow Small Fry on facebook. gave a set of customized drinking glasses with each family member on one! Books for my family are always my favorite gifts! I instagrammed your button! All of the gifts are great! My favorite family gift was a painting by my Nana. She passed away a few years later, and I will forever cherish that painting! My favorite gift I’ve given was the scanned slides my husband and I did for my dad from his mission. It took us hours and hours and hours but the look on his face when we realized what we had done was priceless. i follow small fry on insta! My favorite gift was a gift not actually given to us, instead the amount of money that would’ve been used on our family was given to a charity and what better a gift for christmas than a gift that really teaches a family about giving! So often we get caught up in all the wants that come with christmas that we forget that christmas should be about the joy of being able to give! Such a great lesson for my daughter to learn! My babe was born right before Christmas Day and I got to bring him home from the hospital Christmas morning. Best present ever. my favorite gift given was from my 93 year old grandmother. She made me the prettiest origami flowers in a flowerpot! My husband made me a video of the first six months of my daughter’s life. Always makes me cry to watch it. Plane tickets to see my family have by far been the best gift my little family has ever been given. I love being with all of my family for the holidays! I am following Small Fry on Facebook! oops – posted the comment on the wrong entry (hard to see when doing this on a phone). we just had a baby in June, so this is our first Christmas receiving “family gifts” … my brother got us a white noise machine & crib mobile (yes, we already opened the presents!). sleeping baby = happy parents! My favourite family gifts have always been boardgames. At our baby shower someone bought us a board game called “dixit family edition”. Even though we won’t be able to play it with our DD for years it was such an awesome unexpected gift! Our favorite gifts to give are for fun experiences, a gift card to try a new restaurant, concert tickets, spa packages, etc. The best family gift we got was when my husband and I were first married and we were given a box of food storage to start. It was full of essential things! Perfect. I follow in Instagram too. Favorite family gifts are always classic children’s books. I put the small fry button up on my blog! My favorite gift was for my mother in law. She had just gone through heart surgery and we were all feeling so blessed and lucky to have her with us. We contacted all of her friends, siblings, grandkids and relatives and had them all write her a letter, telling her favorite memories they had with her and how she has affected their lives. I collected all the letters and put them in a cute box and gave it to her Christmas morning. Lots of happy tears that year. liked on FB… this giveaway is amazing btw! following all your boards on pinterest! Best Christmas gift? The birth of my son last year, just in time for Christmas Eve! I follow SmallFry on Pintrest! Very favorite gift that we’ve received is our handmade color wheel quilt. It’s a stunning new family heirloom. My favorite gift received was an ornament for my son’s first christmas last year. I would love to get a portrait!! Favorite family gift- a full fridge when we brought our baby girl home from the hospital this past August! My favorite gift that I think I have ever given to my family is something that I am making them this year. I am making a set of family peg dolls for each of my girls. I think they will really enjoy playing with dolls that look like their family. And bonus-I painted them (extra special)! I was given my great grandmother’s copper tea kettle. The best gift that I have ever received was a beautiful diamond pendent from my husband on our tenth anniversary because it was so unexpected and thoughtful and out of the box for him! Still love that man tons! Our favorite family gift was a personalized family name sign. My dad always gives his “special gifts” to us every year since we were little. They are always really great presents! Every year we give our children and grandchildren ornaments! one of my favorite gifts to give and receive is artwork. it doesn’t have to be expensive, and there is so much original talent out there! it’s fun to customize the piece to the individual or family and their home. One year, Dad bought the family an army parachute. (Say what?) When erected with a single pole in the middle, it became a tent! It was the only tent that accommodated our family of 8 we could afford. I thought it was cool… When we put a lantern in the middle, the orange and white stripes lit up like a magic circus tent!! You’ve done it again!! This is amaze-amous!!! One year, a dear friend gifted me the most lovely custom postage stamps that featured my own tots. So sweet. Following on Instagram and loving every minute of it. One year my parents didn’t have enough money to buy any “gifts” for us kids (there’s 7 of us!) and so they wrote us each a special letter stating the things that they love about us. It has been the most precious gift that I could have ever gotten from them. I will treasure it always. we got an ipad last year and it has been such a great gift for our family! we travel a lot and it’s lightweight and easy to carry around which is perfect for us! books … My favorite gifts have always been books .. For just me .. For my daughter .. For all of us ! This year my family wrote a family journal where each person wrote a journal entry about their year. It was so personal and meaningful…I think it will be a family tradition! Can I please have the Tee pee? Pretty please? Every year my in-laws give us a DVD of old family videos they’ve converted from VHS. So fun to watch my husband and his sisters as little kids! Small fry button is on my blog (jordanandmeaganflake.blogspot.com)! My favorite gift I received was my first daughter. She was an early Christmas present three years ago. my brothers and I chipped in and bought my mom the vacuum she wanted! My favorite family gift I’ve ever given was last year I made infinity scarves for my, now, sisters-in-law. My favorite family gift that I have received was a family season pass to our local zoo. It gave us an opportunity to do something as a family over and over again throughout the year. My favorite gift I’ve ever given was the bed frame my siblings and I all built together for my parents. They had never had an actual bed frame in their 20+ years of marriage and they loved it. I was able to give a family a free family portrait session from a local photographer by writing about how deserving they were. Best gift I’ve ever given. I instagramed the button! I couldn’t pick just one item! They are all so great. I would love all of these for my Vincent! I follow on instagram as well! The best gift I received for my family was a beautiful children’s Christmas book. I loved it and have been adding more to our collection every year. My kids love reading them and I love them too! why are your giveaways all so unbelievable??!!! my parents have given us a christmas themed book since we were little with a note from them. i have oodles of books that i pull out every year to put around the house for christmas reading. i love that special part of christmas. i follow smallfry on pinterest!! 1. button is on my blog. 2. button is on my blog. 3. button is on my blog. 4. button is on my blog. 5. button is on my blog. i tagged you on instagram with the bluum box! The best gift I’ve ever received is motherhood! But if there’s one other thing I enjoyed receiving, it’s a gift certificate to a spa treatment from my husband. My favorite gift I’ve given is a picture of my son and his cousins to my mom. I made my inlaws a huge family tree with flattened spoons engrave with everyone’s names and bdays on it. It was a lot if work but turned out wonderfully. the favorite gift i received was my favorite drink from starbucks, a huge card, and a rose to start off the morning and then my husband took pictures of me and my kids at the park…it means a lot since i’m so busy behind the camera and never actually in the pictures. Great Pinterest boards, following now! My parents give all the grandkids ornaments every year and it’s always something we look forward to receiving. My favorite christmas gift was given to me from my husband , and it was a quilt made out of my Dad’s clothes. A memory quilt. Now I have the gift of snuggling with my son in it. I’m following on Fb,Instagram & Pinterest! My favorite gift we have received was a trip to California from my sister! Last year my in laws treated us to a cruise to the Bahamas. I swear to you, it was the first time I’ve been truly relaxed since I had my first child 5 years ago! That whole all-inclusive thing plus grandparents to help meant I could actually do simply nothing! I love getting games or puzzles my family can do together! We got an oversized floor puzzle from pottery barn kids of 3 cool robots! My son (who was 3 years old then) loves to work on it as a family- which makes my heart happy: it feels like true quality working on it together! My family received a family game night goodie basket. It included snackies, games, and s cozy blanket! We love it, and it encourages us to slow down & spend time with what matters mist ~ family! Pinterest, facebook & instagram follower! Last year, I gave my husband a nook and now my son reads stories on it too! Favorite gift I’ve received for Christmas has to be watching my two little girls open their Gifts. Im so grateful for my children. Yes, there are days I crave my ‘freedom’ of not being a parent. But there is nothing that replaces the beauty and growth that parenting brings. Christmas becomes so much fuller with little ones. My favorite Christmas gift was the one my mother gave me last year of this (what I then thought) really ugly snow(wo)man that had a tiny snow baby inside of it. It was not my taste at all but she knew my husband and I were starting to try and have a baby. I conceived my son in January and as the year has passed by, and I gave birth to him this past September, and enjoyed the greatest gift of all, that is him these past months, it has sat on my nightstand and with each passing day it grows more beautiful to me. I look forward to giving it to a friend who also is trying to conceive some day. I love this blog!! One year we gave away our Nintendo wii annonomously to a family in need. Best Christmas!!! My favorite gift each year is from my sister and it is an ornament with my children’s photo from that year. This year we are going on a family vacation and I think that’ll be the greatest gift of all; just getting to hangout all together, which doesn’t happen very often. my in laws got us a trip to florida!!! who hoooo!!! One of the best gifts we recieved as a family was a simple jar with slips of paper and pencil with the intention of daily/weekly writing down fun lines our kids said, accomplishments, goals reached, lessons learned etc. On New Year’s Eve we read the jar full of wonderful memories of the year past. Now it’s a tradition we have shared with others and continue ourselves. Something so simple and enjoyed by everyone. Always a favorite: /blurb picture books. Love having tangible pictures in this digital world. I think I’m supposed to leave Comments on the actual other social media small fry spots. But in case not, ima follow suit and say: i’m following you on instagram. And this girl is following you on pinterest. My favororite family presents given are the holidays that we’ve been the most broke! We got creative one year and did all homemade and it was so fun. We made a lot of delicious goodies to give away in the kitchen and put them in baskets. The dream big button is up and running on my soon to be famous blog! Oh I hope I win. Wouldn’t mind having some presents under the tree other than toddler paraphernalia. yep, sOmetimes I’m selfish. And instagrammed my favorite too. We have a lovely personalized tree ornament that my mother got us – all three of us as pickles! It’s adorable and it makes my daughter so happy. Thank you for this terrific giveaway! Every year my husband blows our “budget” for each other, but the greatest gift is actually him. His enthusiasm for the season is awesome, and I love that about him! One of my favorite family gifts is more of a tradition: we do white elephant each Christmas. It’s fun and it’s much more pocket-friendly than buying for every single family member. I am now following you on Facebook, Twitter, Instagram, and Pinterest. I know this is really lame but my favorite family gift so far has been our little boy! He is so precious and I don’t think it is possible to love him more! One of the best family gifts we gave ourselves was a trip to Disney at Christmas. The decorations ,the music , the magic of Disney, it was a great vacation. One year I put together an ice cream sundae gift basket for a family gift and it was a big hit. Very fun gathering all the items to give! Favorite Family gift was a zoo membership. My kids love the zoo! I love experiences more than things- I loved the Christmas my sister took us to the beach for hte weekend instead of sending gifts! I love my new laptop! Our fav christmas present to the kids was a mini trampoline! And I am following you on Facebook too! Yay for giveways! My favorite gifts to give are the ones that I have made with my own two hands. I like working with felt and clay, and I like to sew. My favorite gift I have given was to a friend for her birthday: a frog on a lily pad looking at a fly, all made out of clay. this year i’m giving my nieces and nephew a personal blender for making smoothies in the morning! i make a healthy smoothie with lots of greens for my son every morning, and am excited for them to do the same. My favorite gift, is MY HUSBAND!! We met in December! He has taken my 3 children as if they were his own, I couldn’t ask for any better of a husband or father!! Merry Christmas!! One of my favorite things is the nabi2 tablet– we bought one for my husband last summer, because he is so ROUGH on his electronics- always dropping them- so I did some research and ordered him a nabi2 tablet– it is made especially for KIDS, and can take rough handling, but is still a top of the line Android tablet!! My favorite thing is a good pair of jeans. My favorite Christmas Gift happens every year. It is watching my two boys open their gifts from Santa. The joy and excitement is the best gift a Mom could ever receive. My favorite gift was given to me last year. My sister-in-law gave me a picture of my dad earlier in the year that she had enlarged and “painted” for me. My dad passed away almost 2 yrs now. My son and family had it matted and framed for me and gave it to me for Christmas! I love it and reminds me everyday how much I miss him….but remember all the great memories he gave me. I am very excited about the new food processor I’m giving my husband for Christmas (yes, he wants it – but doesn’t suspect). My favorite gift that I have ever given was pictures made into ceramic tiles for a newlywed couple. My favorite present was from my Aunt and Uncle when I was young. It was a really cute bean bag dog that i absolutely loved and carried everywhere. I like what I see on your blog. Probably the best gifts our family ever got and gave….were books. We were given a special Bible story book that was perfect for our little ones with beautiful pictures by Frances Hook…back in 1979. Loved it and we all memorized some of the short stories. Thanks for the giveaway opportunity. Blessings. Every year my dad gets everyone in our family Harkins loyalty cups and gift cards so we can go see movies together all year long! When we were in the hospital giving birth to our first born, unexpectedly early, our families hired a cleaning service to clean our house top to bottom. With everything we had going it was so wonderful to not have to worry about whether the toilets were clean, etc. I am a follower on FB!!! Are you kidding me?! This blog is getting better and better! Ha! Favorite family gift? Geesh, we got sleds when we first got married so my husband and I sled all the time. Feels like we are kids again! I instagramed the tee pee, I’m seriously obsessed with it!!! One of the best family gifts was a zoo pass – so much fun & memories made with my little ones! Love this giveaway! My husband got me an espresso machine – the gift of coffee is the gift that keeps on giving! I follow ya’ll on Instagram! ….and Im a fan FB! …and love yas on Pinterest! My favorite gifts would have to be anything my grandchildren have made for me. Love following Small Fry by e-mail, facebook , and Pinterest. Favorite gifts to give are games. We love receiving games we can play as a family and love giving them for the same reason. I’m a new fan from ‘One Good Thing byJillee’…my fave gift I have given would have to be my homemade doTERRA infused essential oils bath salts, scrubs, hand soap, facial cleanser, toner!! I think my favorite gift almost every year is the quilts we receive from my mother-in-law. She makes piece quilts every year and we will usually get one every few years. She rotates between the adults & the grandkids (& there are a lot). She has 8 children (all are married), 33 grand-kids, 18 great-grandkids & 1 great-great grandchild. I gave my husband a book with every picture ever taken of him and our son his first year of life. We love to look at it! My favorite gifts were matching necklaces for my daughter and I from my husband. Last Christmas my husband gave me a beautiful and cushy rocking chair, I was 7.5 months pregnant at the time! 9 months later I still sit in it everyday with my son! My best gift ever. Last year my husband and I put together a book of all of his siblings, their spouses, and children’s testimonies and we gave it to his parents. It was such a fun thing to put together and then to see the reaction of his parents was so special! Fav gift given to me has been old family photos that date back to the 20s and any original artwork by friends or family. I have already subscribed to your feed. this would be an AMAZING gift for all! I have also liked you on Facebook! My most favorite family gift I have ever recieved is our Apples 2 Apples Game – we have worn it out and had so much fun playing it together. My favorite gift I’ve ever received would have to be handmade art from my husband. He’s an incredible artist and graphic designer. Every year that we were together he would put together a piece of art on canvas that meant something special to us. My favorite being a special painting from the year we got engaged. Gifts with meaning and memories are so beautiful and you can’t beat a one-of-a-kind gift. I’m excited to see my husband open his main present this year – a complete korean bbq for our dining table, to have the experience at home. My favorite gift this year was my nurseryworks empire rocker..love that thing! My favorite gift is anything handmade! It sounds silly, but my favorite gift was a woven picnic basket with settings for four people. My favorite gift I ever received was last Christmas when I found out I was pregnant on Christmas morning. This was after a year of fertility treatments, 4 actually, that had all failed. We were told our chances to ever get pregnant was less than 2%. Well we had a lucky less than 2% Christmas. I gave dads and their sons matching diy bow ties! so cute! My favorite Christmas thing is our new family ornament every year. We love receiving and giving books! I would love to enter. My favorite give would be for my husband this year. I got a great deal on a used tablet that he will just love! My favorite family gift I’ve received is the simplest, when we were growing up our family friends would always give us a movie and treats. It was my favorite thing to watch a movie as a family and munch the night away! Didn’t know you had pinterest… following now! favorite gift i’ve given: this year my kids and i sent my grandmother 25 envelopes to open this advent. they were filled with old photographs, treats, and art by the kids. her joy in opening them has been the best part of this christmas. My first year living abroad, as a wide-eyed 21-year-old English teacher in China, I received a box in the mail from my sister. Inside were crammed a Christmas tree and handmade wire ornaments. In a burst of holiday spirit (=madness…), I decorated my small apartment and invited all 200ish of my college students over for an open house. It was crazy and wonderful and my sister’s thoughtful give was the impetus. My favorite gift memory is from when I was little and my family donated a portion of our “Christmas gift allotment” to a family in need. We got them a big CD boombox and various other gifts. I will always remember how good that felt! Aaannnd, I now follow on Pinterest! My favorite family gift given are photobooks. Time consuming but worth it! My favorite gift ever received was to have someone pay for my gas at a gas station. A total stranger. It was unexpected, it was the kindest gesture, and it actually came at a time when I needed it the most. It had a profound impact on me and made me want to pay it forward… Which is what I would do if I won this giveaway! I hope you all have a merry Christmas! and I like smallfry on FB! A couple of years ago all of the kids in my family transferred all of my parents old slides and photos onto a disc and made a video that we all now watch every Christmas Eve! fav gift: my husband gave me a fabulous camera after we had our son. now I am able to capture all the precious moments with my sweet little family. My favorite Christmas gift that we received as a family would have to be a handpainted ornament given to us by a friend. She did such a beautiful job and it fits us to a T. I love putting it on the tree each year. i follow small fry on facebook, instragram and pinterest. I’d have to say, the best family gift that I ever gave- was to a family in need. They had a small list of things that they ‘wanted/ needed’. Christmas tree, lights, ornaments, books, and a sweater for each of them (four). So, I went out and got everything on their list! That was better than ANY gift I could have gotten, all throughout my life. My favorite gift was given to my mom and her husband last year. They were able to make and bottle their own custom wine! They loved it! I “liked” Small Fry on fb! one of my favorites was actually this year! my in-laws gave everyone their choice of a christmas painting of the Savior. it pretty much makes me cry every time I look at it! Last year, my parents made my husband, brother, sister-in-law, and me a cookbook of recipes mt brother and I grew up with as kids. For the last couple of years they had been collecting recipes and writing them down (since most of them were in their heads) and cooking/baking them and photographing them for the book. I use the book all the time now and it always makes me feel like I’m right at home cooking with them as child. My favorite page is the banana bread page since my mom took a photo of recipe we always used–stains and batters splatters included. Such a thoughtful and memorable gift. one of my favorite gifts to give is a handmade blanket. its something that can be used year round, and i feel like it is something really special that i can put love into. My favorite Christmas gift had to be a horse for me and my siblings! i cried one year when santa brought me a bike for christmas. best present yet! A few years ago I made a picture calendar with pictures from all of my siblings and their families for my parents. Now, every year they have me make one for each sibling and their family. I have the smallfry button on my blog with the link connected to it. I instagrammed the family tree kit and tagged it. A couple years ago my entire family went in for holiday family photos, it was a great experience to all do together and to have the end result! I just “liked” the facebook page! My favorite gift was a trip to Disneyland with family. Seeing my son’s face light up with every character and scene that we passed was amazing! The best gift I have received has simply been a phone call from my family saying that they bought me an air plane ticket to go see them. I missed them so much so I was incredibly excited. We are 4 hours on plane away and I only see them 2 times a year. one of my favorite gifts i ever gave was a handmade scrapbook calendar i gave my mother in law a few years ago. she loved it and i loved seeing it all year hanging at her house! My favourite gift I’ve received we’re a pair of hand knit mittens with birdies on them in two of my favourite colors:) thanks for the great giveaway! Pick this lass. I follow you on insta. My favorite family gift we ever received was a crockpot! It freed up so much of my time! Winning this give-away would be pretty awesome, though, and it might just the crockpot a run for it’s money! My favorite family gift I’ve received was a family trip to Disney World! It was such a great memory and we had such a wonderful time as a family. The memories have lasted much longer than the gifts we would have received otherwise! I added Small Fry’s button to my blog! My favorite family gift is the book of pictures of my son that I made for both sets of grandparents this year. My favorite gift is the bike I got for my med school husband. Those walks to campus in the hot hot summer nearly killed him. Oh and I like you on Facebook now. My favorite family gift is a photo book of the year’s memories. I love the Clemme Sue Tee Pee and I know my son Forrest would love to play in it too!! This year my favorite gift that I am giving is my son’s first Christmas ornament. I follow your lovely pictures on instagram!! I follow your pins on Pinterest! It’s not a “gift” per se but being able to be with family at Christmas is gift enough for me. My favorite family gifts are the ones that I can do with my family!! This year we got an open gym gymnastics membership for my 3-year old from my parents. This should help keep him busy and feeling special when the new baby arrives! I follow you on pinterest!! I’m cristihelena!! A favorite family gift is a patio table and chairs where we can eat early morning breakfast in the summertime or look at the stars at night. My husband gave me a beautiful necklace last Christmas insribed with a D for our little daughter Dylan. Constant reminder of my sweet husband and daughter. Ahhh I want an Ashmae portrait so bad! My favorite family gift I’ve ever received is one we got as a family when I was in high school. We got a game table–Pool on one side and foosball on the other! My absolute favorite family gift is a quilt that my Grandmother made when she was 10 (87 years ago!). She was an exquisite seamstress, and her knack for making beautiful things clearly started young. It is a treasure! I follow your fab pins on pinterest!